8 peeled medium tomatoes. A paste variety is the best - roma, etc. Fresh: Simple place all of your ingredients in a food processor and blend until smooth in texture and then refrigerate. Garnish with a little bit of finely chopped cilantro and onion for an added extra Fresh picante will keep for around a week or so in the refrigerator. To Can: The above recipe will make around 2 to 3 half pint jars - so we usually just multiply the ingredients x4 to can a dozen at a time. Simply process the ingredients the same way and add to a large pot. Bring to a very slow boil and let simmer for an hour. 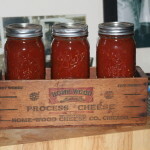 Then simply jar up and stick in your pressure canner for 15 minutes - or water bath for 40 minutes - and you have access to home-made year round picante salsa!